The original factory site of 4000 sq. metres in Harvey St. Eagle Farm Qld. 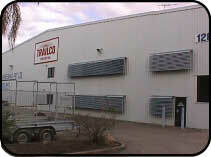 was outgrown and the business moved in 1991 to a new factory on a 10,000 sq. metre site at 1289 Kingsford-Smith drive Pinkenba Qld. where it is presently located. Since 1984 we have marketed in house designed and manufactured hard poly hosereel type irrigators trade marked as PolyReel® initially piston powered 90mm and 110mm diameter hose but since extended to a range of machines powered by our Turbine Drive and speed controlled by on board computer with hose diameters from 40mm to 140mm. Since 1987 we have marketed a range of our own designed foot valves, flanged pipes, hydrant valves, bends and other galvanized and aluminium fittings. Effluent spreading machines and Boom Irrigators have more recently been added to augment what is Australia’s most complete range of irrigation machines all of Australian design and manufacture. Since 1988 we have had a CAD based R&D section for product design and testing and since 1996 we have had in house printing of all manuals, spare parts lists and brochures to ensure that any and every engineering change is faithfully reflected in the documentation provided. Copyright 2004 Trailco Irrigation Australia.